Our feeds will soon be filled with fireworks, BBQ's, and of course everything red, white, and blue as Americans gear up to celebrate the most patriotic day of the year: the Fourth of July. And just like Valentines Day and Mothers Day before it, Independence Day should be a major date on your marketing calendar. With the average American spending approximately $300 each, retailers in every industry can take advantage of this spending bump by promoting their brands with a fun marketing campaign. 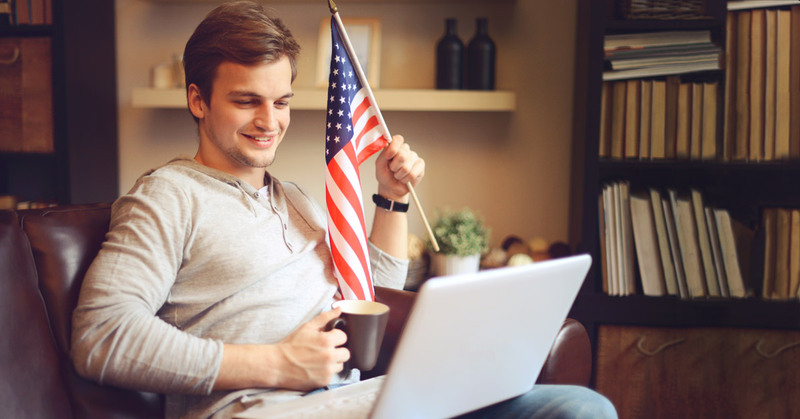 So before you start planning which get togethers you'll attend this year, take at look at these five ways you can drive traffic to your online store this Independence Day. 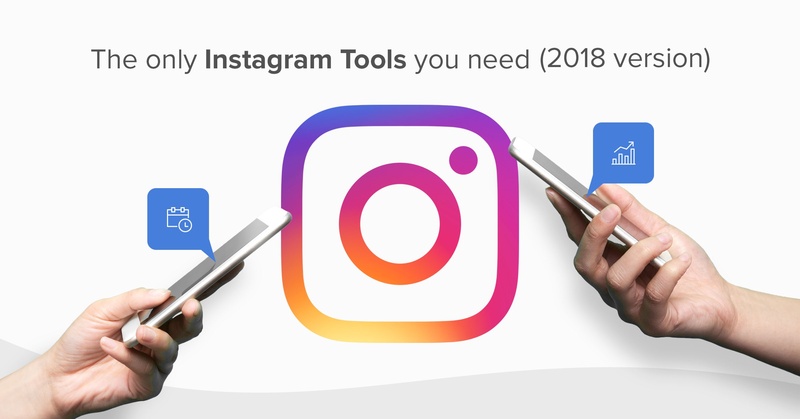 Holidays are the perfect time to have more fun with your marketing campaigns, and with 400 million monthly active users and more than 80 million posts per day, Instagram is the perfect place to expand your reach and try something new. While Instagram is the obvious choice for a photo contest, what might not be so obvious is how to actually run one. Check out this step-by-step guide on How to Run an Instagram Contest and keep reading for a few ideas on different contests you can run. Show us your selfies. Two things Americans seem to love: America and taking selfies! 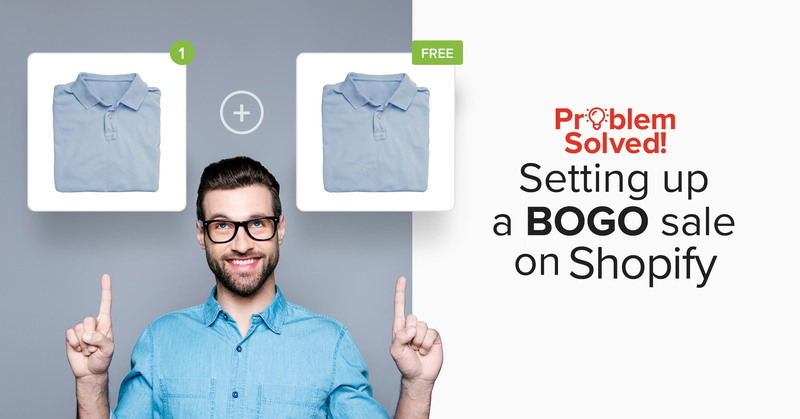 Let your customers supply the content and drive traffic to your page by posting a selfie with your products, or even get them to show you what they're doing to celebrate: Best selfie wins! Like to win. Want to spread the word about your newest product? Create a statement-worthy image for Instagram featuring the product you want to promote and get your customers to like and re-post the picture for a chance to win it. Partner up. Reach out to brands you admire online and suggest a cross-promotion. You both get double the exposure and a potential onslaught of new followers. Take this promotion by Quay Australia and Frankies Bikini's for example. 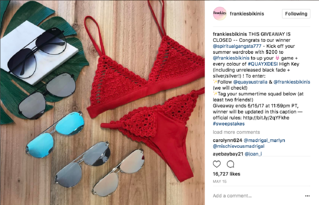 Two brands selling complimentary products (bathing suits and sunglasses) teamed up to offer a giveaway on both their Instagram pages. All followers had to do was make sure they were following both companies and tag two of their friends in the comments for a chance to win Quay's newest collection of sunglasses and a $200 gift certificate to Frankie's Bikini's. Engagement was off the charts! Both posts combined got 42,223 likes and 19,771 comments. So don't be afraid to reach out to another company to set up a promotion! Even if you sell similar products or offer similar services, the benefits are hard to ignore. Don't forget to use your brands hashtag, or even create one specifically for the contest though. It's a no-brainer. Tweets with hashtags get twice as much engagement as those without them and 55% more retweets. #July4th, #FourthofJuly, #IndependenceDay, #starsandstripes, #bbq, #redwhiteandblue, #fireworks, #America, #freedom, #patriotic, #celebration. 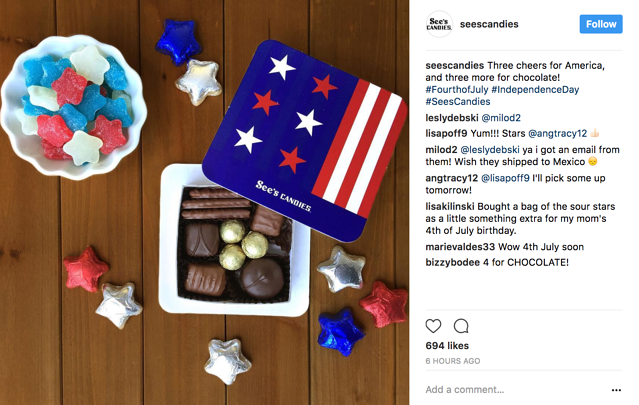 See's Candies killed it with a beautiful, on-theme Instagram post using both #FourthofJuly and #IndependenceDay, throwing in their own #SeesCandies hashtag for good measure! Pro tip: Since most of your customers will be traveling or out celebrating this Fourth of July, make sure your campaigns are mobile-friendly and designed for quick engagement. Facebook image posts get 179% more interaction than links, text-based posts, or videos, so make sure you're getting in on that action. Have fans submit photos of themselves with your products, or better yet, get in the holiday spirit and have your customers share their best red, white, and blue outfits or flag pics! If you sell beauty products, get your customers to submit their patriotic make-up looks or amazing themed manicures. Sell food/kitchen supplies? 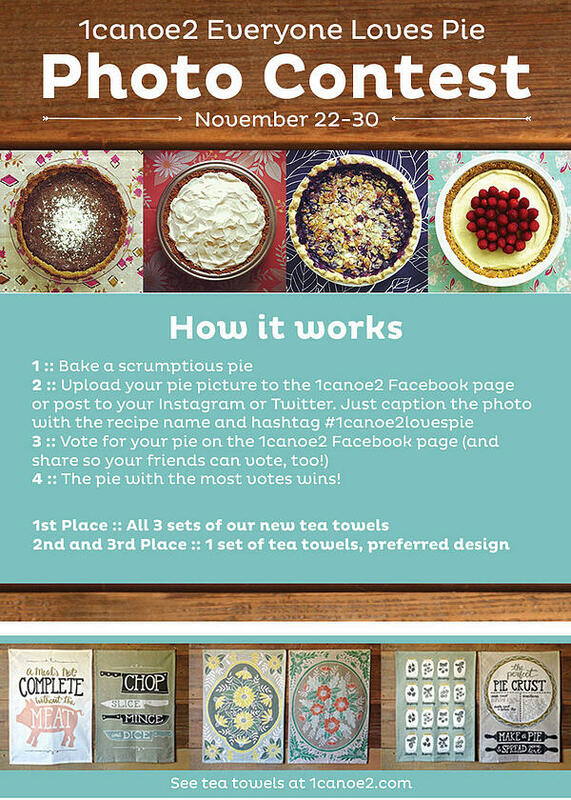 There's nothing more American than apple pie: get your customers to post their best creations on your Facebook page. While it's not centered around the Fourth of July, here's an example of a 'sweet' Facebook contest you can run. No matter what you decide, make sure the rules are clear, and remember to offer a prize to the picture that gets the most likes or votes. Your customers will spread the word across their personal networks, leading to an increase of likes and potential new customers. Plus you'll get some awesome user-generated content that you can re-surface throughout the year. Switch up your homepage by featuring a collection of your most patriotic products. Try featuring all red, white, and blue products, a round-up of your favourite patriotic items, outfits for different types of Fourth of July celebrations, or everything your customers will need from your online store to host the perfect BBQ. While featuring a collection on your homepage might not seem like a way to market your store, 62% of people said they plan to buy holiday-related merchandise, and it's the perfect way to make those products easy to find. 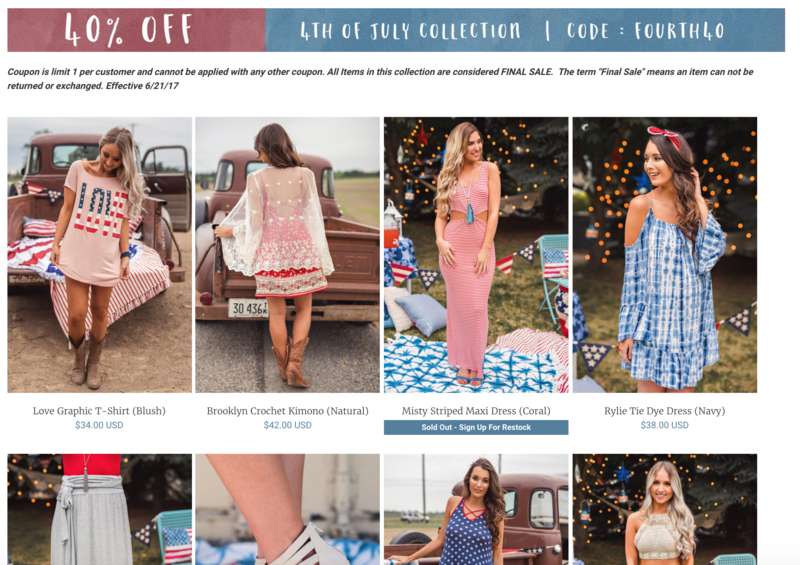 Nana Macs, an online women's boutique, got into the holiday spirit by featuring a Fourth of July lookbook on their homepage. Store owners have seen a 32 percent revenue increase just from email marketing alone! So if you're strapped for time or don't want to dive into the world of social media just yet, an email marketing campaign might be perfect for you. We love this guide on How to Create an Email Campaign in 10 Minutes (A Step by Step Guide). 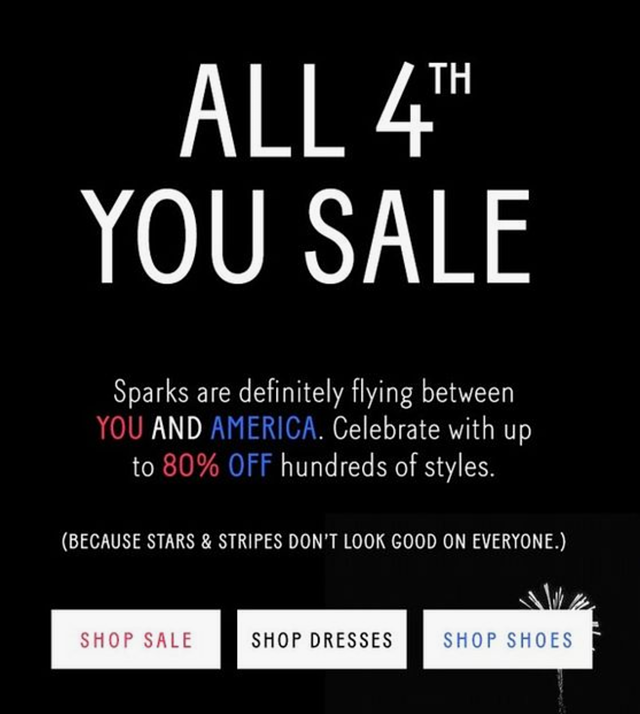 This Nasty Gal email nails that Fourth of July feeling without being in your face about it. Their sale is clearly outlined, they have links to different areas of their website to shop, and they used red, white, and blue perfectly. Plus who doesn't love a good pun! A discount code for a future purchase to everyone who participates. A moment in the spotlight: Tap into your users vanity by promoting their story or photo on your account. A gift certificate to your store. A prize from one of your sponsors/brands you carry. 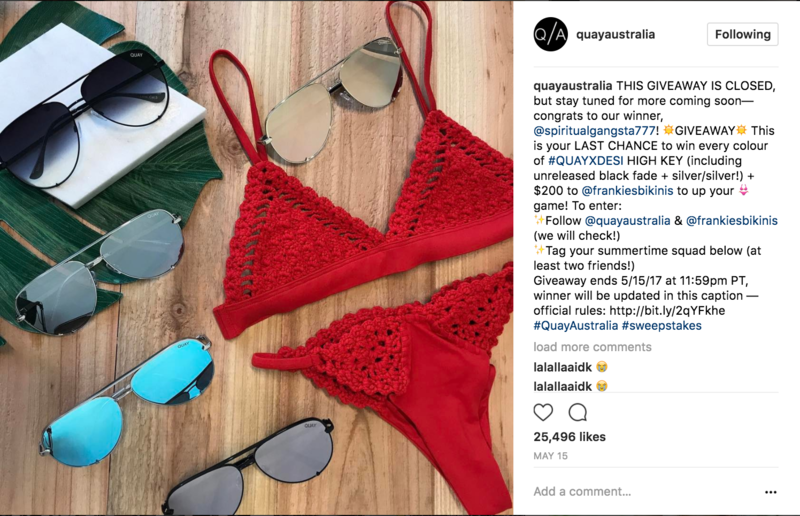 A prize package with products from another company to get even more attention (like Quay Australia and Frankie's Bikinis did). And if that doesn't fit in with your plans, you can still reward your customers by running a classic sale on your store during the holiday weekend. Don't forget to tag your store in the comments below to let us know what you have planned!